The Ravnica Allegiance prerelease is happening this weekend. And I’m pretty excited for the set. I don’t normally preorder to many cards from sets; but this one seemed a bit different, or at least I noticed my strategy has changed a little with Ravnica Allegiance. 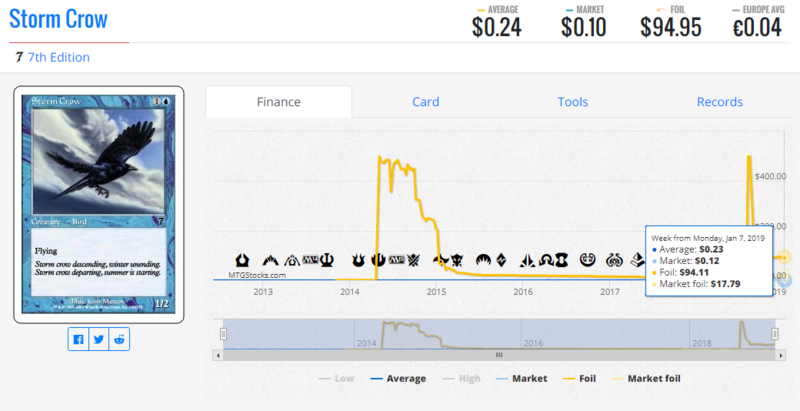 I seemed to have focused a bit more on foil commons and uncommons. So I’ll be highlight those cards that I’ve already picked up. I’ll also do some predictions at the end of this article too. So let’s get right into the cards. I’m not sure if we’ll see this pop up in Modern or Legacy. But I like it for Standard, especially alongside decks that might want to run Absorb. I like that both halves are instants. It seems like a card that control or midrange would want to play to preserve its life total, allowing the deck to reaching the stage where it can take over with a large creature or powerful planeswalker like Teferi, Hero of Dominaria or Karn, Scion of Urza. It’ll be interesting to see if we have enough playable Wizards for a new type of deck in Modern or Legacy. 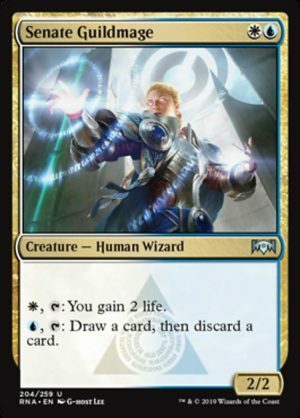 I can see this potentially seeing play with Meddling Mage, Lavinia, Azorious Renegade, Spell Queller, Reflector Mage, and Deputy of Detention to name a few cards. For more…check out all the Wizards in Modern here. The question is…will this deck be more efficient than Humans or Spirits? This remains to be tested. I don’t think this is quite good enough to make the cut in Modern or Legacy, but I could be wrong. Someone please prove me wrong. Thanks. 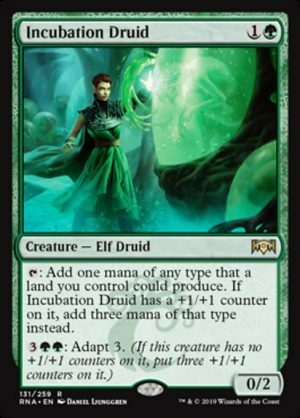 However, I think this could see play in some sort of Simic Adapt deck in Standard that could contain Incubation Druid, Growth-Chamber Guardian, and Biomancer’s Familiar. I like this as a trick to mask Adapt triggers in combat. And untapping that creature just seems like a bonus that will create some pretty nice blowouts. I think this price is too high. But I think I really just like this card. The artwork is sweet too. And it probably looks awesome in foil. But none of those are reasons to preorder this card at that price. I think the card could just end up being very mediocre or bad. But we just have to test it out and see. 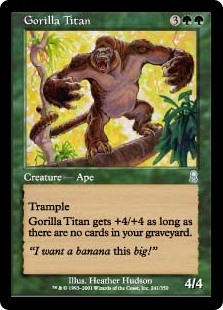 I asked my friend and SCG Open champion, David Thomas, what deck he thinks this card could possible slot into. And he said maybe Grixis Shadow. 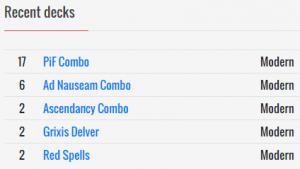 It’s funny how he mentioned that deck and two of them just made the top eight of SCG Worcester. The question is what does Pteramander replace? And what else could you possibly change in the deck? Well for starters…you could replace the Snapcasters with Pteramanders and the Gurmag Anglers with Delver of Secrets. Does that mean the non-creature spell suite needs to change too? Possibly, but I’m not sure what should be changed if anything at all right now without testing. If you have ideas after testing, please let us know in the comments below. 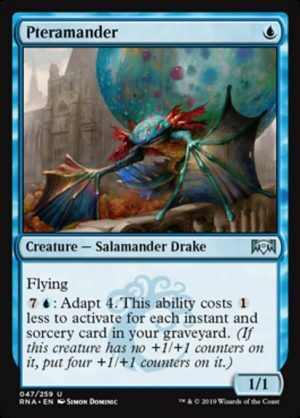 And I guess for Legacy, you could also try replacing Anglers with Pteramanders. At the very worst, they can be pitched to Force of Will. But I’m still not sure if Pteramander is better than Angler since it dodges Abrupt Decay and Fatal Push. This might be an important card to enable Spectacle. It’s a new mechanic, so we’re not exactly sure how to best work with it yet. But you’d better bet that people are going to try hard to break it and use it to it’s best ability because it’s a way to ‘cheat’ on casting costs. And historically, you know that cheating on casting costs is one of the most broken things you can do in Magic which includes the mechanics such as Delve and Phyrexian Mana. I think this card might enable some pretty wonky and powerful decks in Limited. But will it make the cut for Standard Constructed? I’m not sure. Probably not because well have all ten shocklands and checklands in the format. Could it see play in Pauper? Maybe. 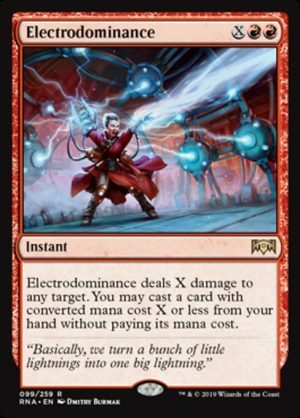 But the only Guildgate that sees play in the format is Boros Guildgate right now. 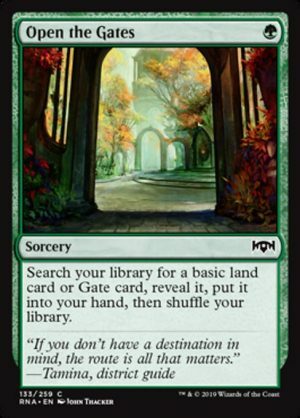 This is a super stretch…but could we ever see a Maze’s End deck that includes this in Modern. It’ll probably be a very long time before that happens I think. So…buyer beware. This is just a fun card that I decided to pick up. 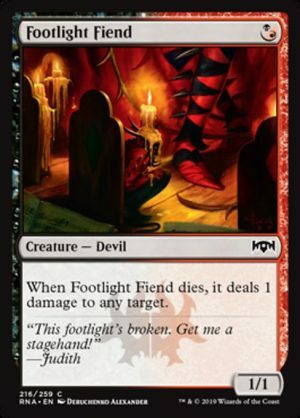 This is another card that could see play alongside Footlight Fiend to enable Spectacle. Will both of these be good enough for something like Modern? Probably not. But we’ll see. 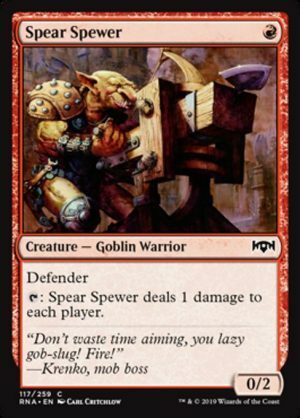 On the other hand, if you can pick up cheap foil copies of Skewer the Critics, definitely go for those as we will most likely see this card in new versions of Burn and maybe Mono Red Phoenix decks. This one of the cheaper foils from this set. And I really like the design of these; plus, the foils look nice. Not to mention, Eli Kassis, just won Grand Prix Oakland with the card in the sideboard of his Izzet Phoenix deck. I mentioned this in article #21, so I put my money where my mouth was. And if you didn’t notice, Eli Kassis ran four of them in his winning list mentioned just before this. 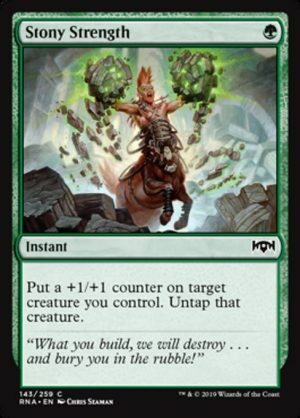 Plus, this card sees a decent amount of play in Modern. One-mana blue cantrips will always be up for consideration when building decks. 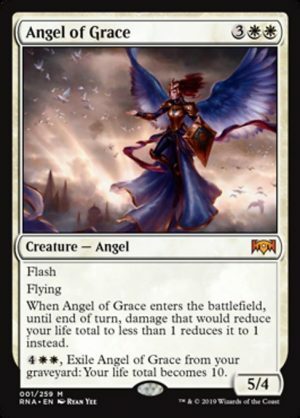 If you haven’t seen Frank Karsten’s You Can Deal Infinite Damage with Judith, the Scourge Diva in Standard article yet, check it out. 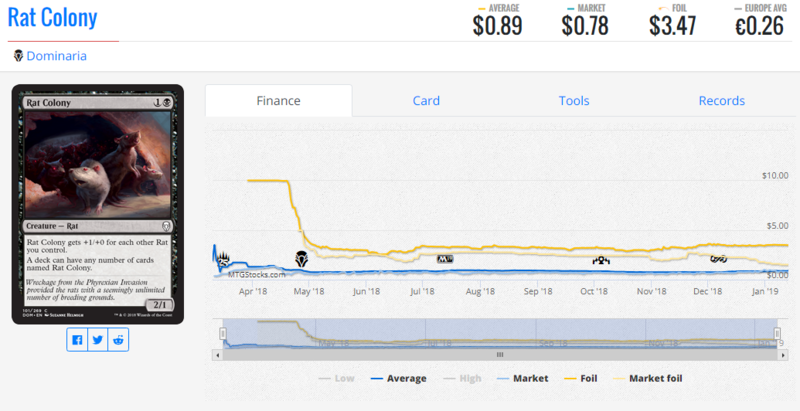 Aside from that, I think someone might break this card in the future. Although it doesn’t provide three-mana, it does half of what Lion’s Eye Diamond does. So we maybe we just have to figure out the other half to make it broken. I mentioned Adarkar Wastes in article #25. And this along with Karplusan Forest are the only ones of the Ice Age painlands that see some play right now. I think these can only go up from here. A lot of this set was printed and opened, but we’ve see one spike already and it could happen again. This is sold out on Star City Games at $4.99 as a preorder. And Card Kingdom has this listed at $5.99. People love these cards like these. 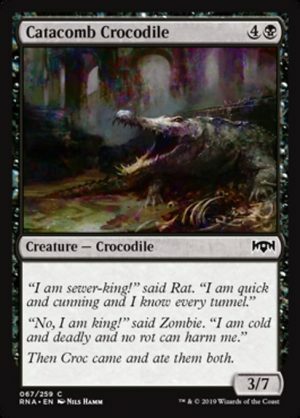 Just take a look at foil Rat Colony. Okay…as promised…here are my predictions for Ravnica Allegiance. I think these are three of the most powerful cards in the set. That is a steep preorder buy-in price. So I would stay away for now. However, the card seems very powerful as I don’t think we’ve see an instant-speed version of this effect yet. 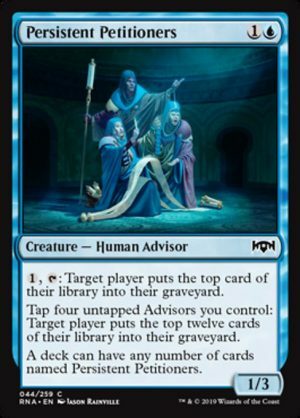 A lot of people are talking about Suspend cards like Ancestral Vision, Living End, and Wheel of Fate. But I think that could just be the tip of the iceberg since this will allow you to play any card at instant speed as it ignores timing restrictions. We’ve seen this with Kari Zev’s Expertise, but that’s a Sorcery. This being an Instant changes the whole game. I think this could be one of the defining cards of Standard. And it could also see play in Modern since you can tutor for it using cards like Eldritch Evolution and Chord of Calling. This could be a very dangerous card. 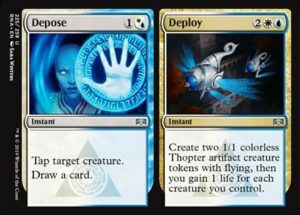 A mana producer that costs two mana is already almost playable by itself. But when you have to ability to turn this into a pseudo Black Lotus every turn either via Adapt or Stony Strength, things can get out of control and scary very quickly.